This model offers 36IR High Efficiency, High Intensity Smart Infrared LED's. These LED's are superior to standard IR LED that all other sellers install to cut corners. The IR LED use less electricity while still providing a longer a wider spread of light. We install 60 and 80 degree IR LED to provide a deep, wide angle of IR LED spread across the entire picture. The Smart IR LED change intensity as objects move closer to avoid washout that is common with most other brand cameras. This model offers a variable focus 2.8mm - 12mm Megapixel lens. Don't be fooled by 4-9mm or 2.8-10mm, 2.8-12mm gives you the most versatility for your installation. 2.8mm will give you a 90 degree field of view for outside perimeter shots. 12mm will get you up close to the action, perfect for doorways, walkways, etc. 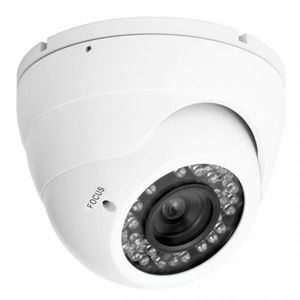 This 2.8-12mm lens is IR Corrected which means that the focus will not change between day and night mode. Most other cameras do not use IR Corrected lens, leaving you picture out of focus during the night. This lens is also a Megapixel lens that was originally designed for Megapixel Cameras, we use them in our Analog cameras to make sure we are using the best parts available. A lens is only as good as it's main component, glass. This model offers a strong cast aluminum housing rated at IP66 weatherproof standard. This camera can withstand almost any climate; hot, cold, wet or dry. The rust resistant mounting hardware will ensure many years of service outside.